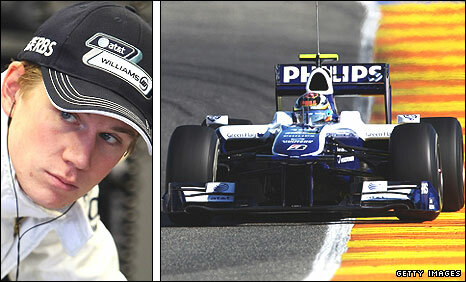 "Nico Hulkenberg has got all the hallmarks of being a future star and Williams are crazy to let him go. "He started a little shakily and I've really enjoyed watching him develop through the year. "Just like Lewis Hamilton and Sebastian Vettel, he sailed through the junior formulae looking strong and was smart enough to learn from his experienced Williams team-mate Rubens Barrichello. "His pole position on a drying track in Brazil was exceptional and marks him out as a star potential. Another team will scoop him up." Name three attributes that an F1 driver must have? The travelling and the pressure. ... it takes a lot more than a good car to win races. ... try to keep it alive. There is nothing else I want to do really but I guess I would be working for my father's truck company. Who is your best friend amongst the drivers? I'm patient, funny and disciplined. Do you excel at any other sports. What cars other than an F1 car do you drive? There isn't one specific favourite song for me. What's your favourite place to go on holiday? Having slept well and slept long then I'd go for a run, see some friends and go to a restaurant and then the cinema. Which famous person dead or alive would you like to have dinner with? Roger Federer because I'm a big tennis fan and I think he is a great personality and a great sportsman. Tell us something about yourself most F1 fans might not know? Well. Hmmm. I can't tell you secrets, can I?